In this drawing tutorial the team of DrawingForAll will show you how to draw Shazam from DС comics step by step. In fact, this character also bears the name “Captain Marvel”, but since our site already has a drawing lesson with that title, we decided to use the name Shazam in this particular tutorial. 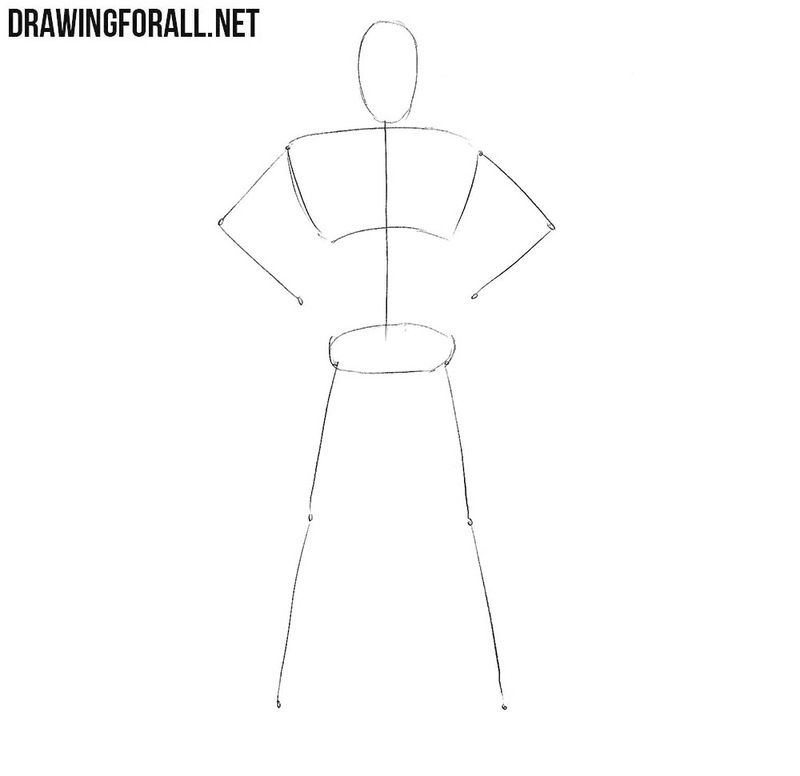 So we begin this drawing guide with the stickman (the skeleton of a character drawn with simple lines). First of all draw the head in the form of a flattened egg. After that, draw the line of the spine. On this line we draw the thorax and the pelvis. As you can see, the thorax and pelvis in this step look like ordinary rounded figures. 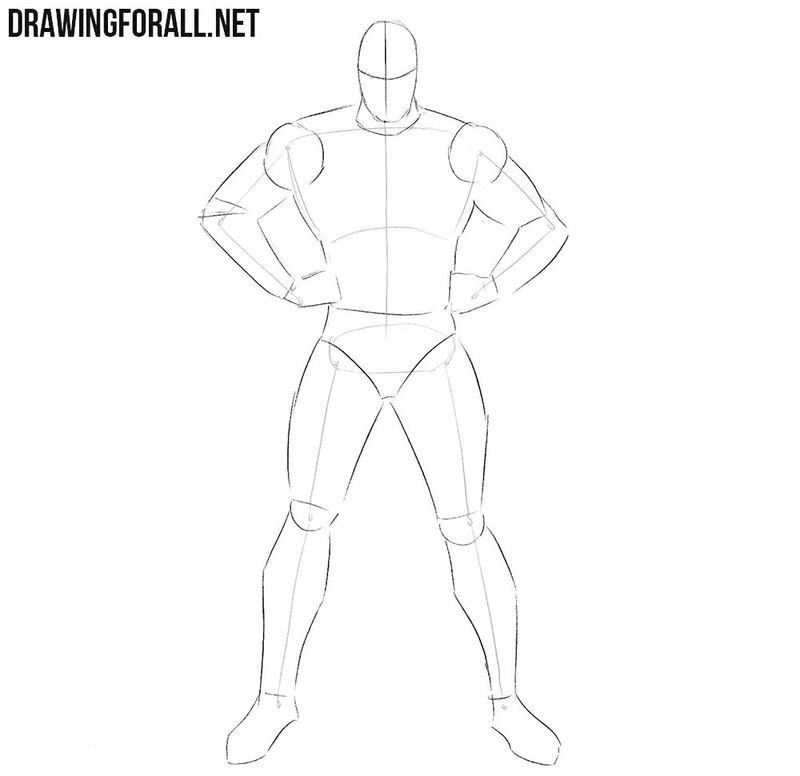 Using simple lines, draw the arms and legs. Don’t forget that all lines should be made with very light lines. Now we will add some volume to Shazam. First thing first we draw two crossing lines of facial symmetry. Outline the neck and body. Please note, that the body should a little narrow to the pelvis area After that we draw powerful massive arms with simple geometric figures. After that we go down a bit and sketch out the pelvis and legs. In this step we need to outline some elements of clothing and facial features. First, we draw triangle which is located behind the left shoulder. After that we draw a cape that goes behind the back hanging down to the knee area. Next sketch out the outlines of the gloves and shoes. In this step we will draw the face in the final version. Draw the ear. The upper edge of the ear is level with the eyebrows, the lower edge is level with the tip of the nose. Draw the line of short hair. Erase the guidelines and circle the lines to make them smooth and clean. We continue the drawing tutorial in which we show how to draw Shazam from DC. Carefully draw out the lines of the body, pectoral muscles and abdominals. In the center of the chest draw Shazam logo. Don’t forget to draw buckle on the collar. Sketch out the cape, as in our example. After that you should draw Shazam’s arms. By tradition, we circle the outlines of the arms, drawing the muscles and folds of clothing. In addition, here we need to draw cross strips on the bracers. So it’s time to work with the lower part of the body of our superhero. First, we draw out a wide belt and a piece of cloth which is located on the side. 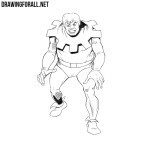 Next, draw out the outlines of the legs taking into account all the muscles and joints as shown in our example. Next, draw out the outlines of high boots. Add the necessary folds and erase all the remaining unnecessary guidelines from our Shazam. 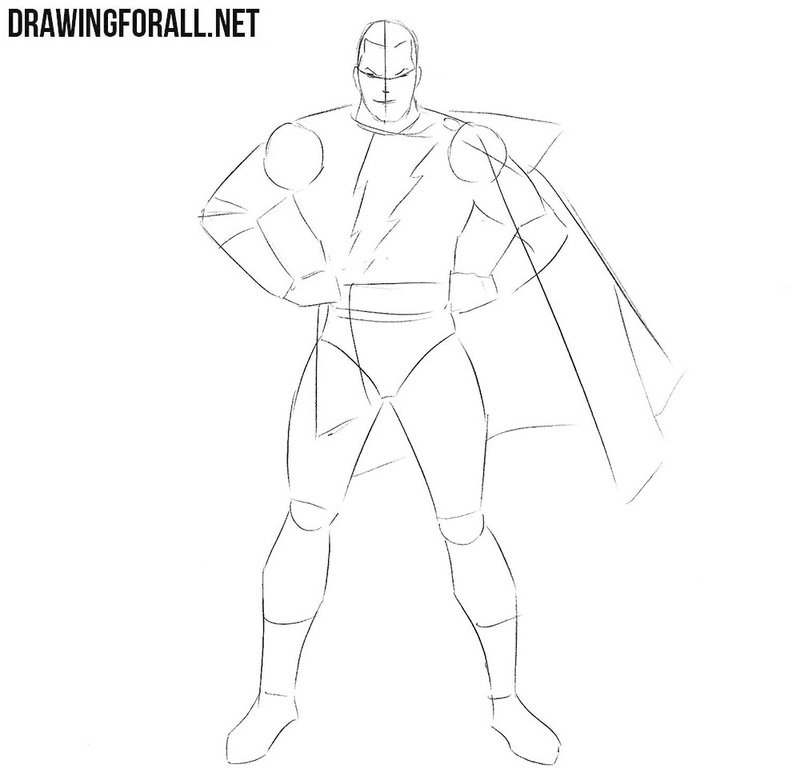 In the last steps of our drawing lessons dedicated to comics we always add shadows, and this lesson about how to draw Shazam is no exception. In this case we add the shadows in comics style. So it will be contrasting and thick hatching. But you can make the shadows more contrast and darker, and it will bring your drawing closer to the images of comics from the 20th century. 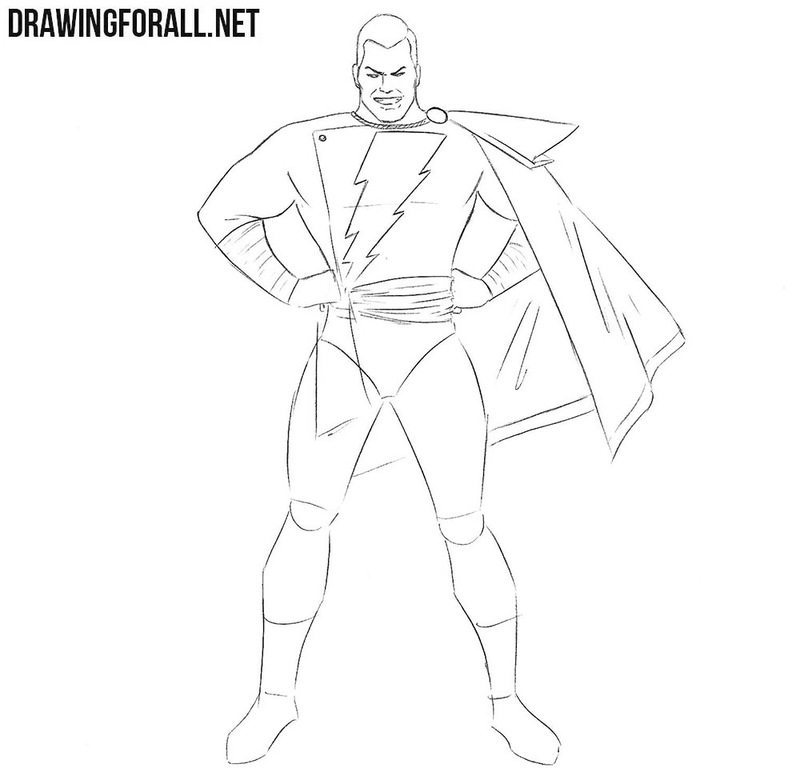 The lesson about how to draw Shazam (or Captain Marvel) was quite challenging, like all our lessons about superheroes and supervillains. 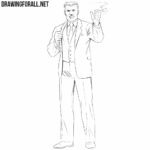 But we are trying to draw characters as similar as possible to what you can see in the pages of comic books, so we hope that being guided by our tutorials you can become real comic artists. The fact is that we always loved comics, and always wanted to be able to draw like John Romita Sr or Jack Kirby. We had to learn by ourselves, studying the technique of drawing comics and gradually improving skills. And we are very glad that we can share our knowledge with those who want, like us, to be able to create stories in pictures. 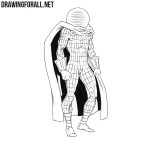 Do not forget to subscribe to us on social networks (for example, Google Plus, Facebook and Pinterest), in order to be aware of all the new drawing lessons by drawingforall.net.